You’ve brought strangers to your website. You’ve given them value and captured their contact information in return. Now your prospects are educated and ready to buy … but they’re overloaded with all the options they have to consider. Video taps into the brain’s emotional center in a way that no other medium can do, making it a super-powerful medium at this stage. Captivate your prospects by telling a story that matches their own. People fall asleep during TV commercials, but body language changes the instant they hear a story. If you show your prospects that you truly understand what they’re going through, they’ll be far more likely to listen. 90% of customers say their buying decisions are influenced by online reviews, and prospects prefer to watch “real people” share their experiences whenever they consider making a purchase. As any Olympic athlete will tell you, visualization is a powerful tool. Helping your prospects imagine themselves using your product or service will engage their purchasing desire without having to “sell” to them. Demo videos work for a variety of offerings, whether yours is digital or physical. 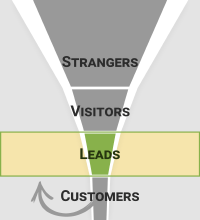 Next step: convert your existing customers into active promoters of your business. Believe it or not, it’s what they want.